Scott Lamps is a Yoga Acharya (Master of Yoga). He is a head teacher of Ghosh Yoga, a method from Kolkata, India that balances traditional yogic practices with modern science. He is the author (along with Yoga Acharya Ida Jo) of 4 yoga practice manuals. Together they teach all over the world. This is his official website where you can see his teaching schedule and read his insights about the practice of yoga. 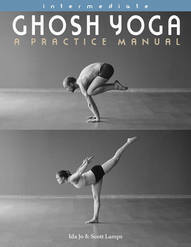 ​of more than 100 postures in the Ghosh yoga tradition.